Jake began to suffer from skin irritations at around four months old, this degenerated into a chronic skin condition by the time he was 2 years old. 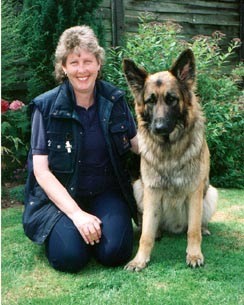 He brought Marie to Tellington TTouch in her search to find relief for his skin condition, leading to the discovery of the benefits of this work, not only in helping Jake's physical problem but as a valuable tool in Behaviour Modification and Training. Jake also introduced Marie to Working Trials, at which he could have excelled. 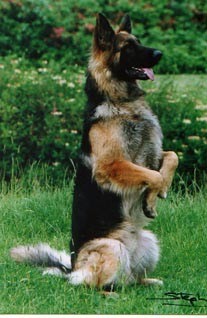 He was handicapped by his handler's competition nerves and the skin condition frequently interupted training. It is to his credit that in spite of this, he managed to achieved CDex on three occasions and Certificates of Merit in UD and WD stakes. Jake retired from Working Trials abruptly when he began to experience difficulty in an area that he really loved, the Agility section, specifically the Scale Jump. He still enjoyed tracking and searching for fun and just loved clicker training. Jake also appeared in a promotional video for Animal Enterprises and in "Dangerfield". 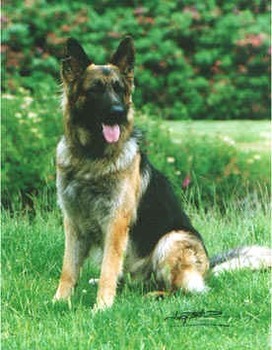 He can be seen on the front cover of "German Shepherd Dog" by Malcolm Willis. 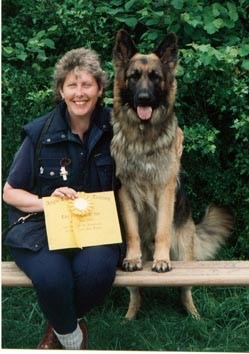 He also graces the pages of "Discover the German Shepherd" by Joyce Ixer and "The Ultimate German Shepherd" by Sheila Rankin. Unfortunately, in 1999 it was discovered that Jake has arthritis in his lumbar vertebrae which caused a number of them to crumble at the base. This intially looked like CDRM because nerves were trapped causing numbness in his hind legs and it was a great relief when he regained some sensation, ruling out this horrible and debilitating condition. He went into semi-retired from his socializing duties because the discomfort of the condition made it difficult for him to work with the more reactive dogs. We became very selective about the dogs he worked with. Jake was still very much part of the Team and when unable to join in, supervised from the van!! 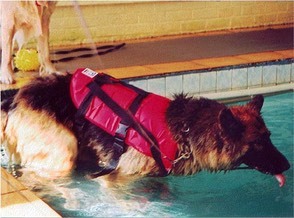 To aid fitness, Jake discovered the 'joys' of therapy swimming. He had only ever paddled in water before and was horrified at the prospect of getting out of his depth. With the sensitive help of Julie from Corley K9 Pool, Jake discovered what fun he could have at the pool. Looking like a 'Baywatch Boy' in his bright red boyancy aid, he used to dive off the ramp into the middle of the pool, soaking anybody who is standing too close and 'rescue' his squeaky yellow ball from drowning! Four years down the line Jake was no longer able to leap off the ramp to rescue his yellow ball but still enjoyed his therapy swim via a much more sedate entry into the pool to 'save' his ball. The pace of his life became slower and he needed more sleep on the various double quilts dotted around the house. He still had a great zest for life, sense of fun and constantly amazed us with his ability to adjust over and over again to his decreasing mobility. 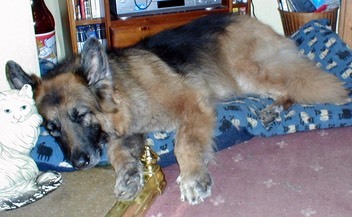 Jake crossed over peacefully on 22nd May 2004. He touched the lives of many animals and people in his twelve and a half years of life. It was a such a blessing and honour to share that precious time with him. 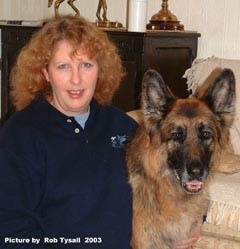 With the gift of his love and strength my 'one in a million' friend and companion Jake changed my life totally. She needed me, I couldn't let her walk away, I didn't understand why she told me to "stay"
We both came home with our best friend! And ….. where was I? - Right there by her side! Together or apart - I love her so much! We're Soulmates, Buddies, Partners For Ever!